Season Two content for Evolve inbound – first new hunter Lennox coming June 23 - Use a Potion! You’ll be able to purchase the new content individually or as part of the ‘Evolve Hunting Season 2’ content pack. Although pricing hasn’t been revealed yet, you can expect that buying the content back will work out cheaper than purchasing everything individually – plus you’ll receive an exclusive skin with each of the five new playable characters. 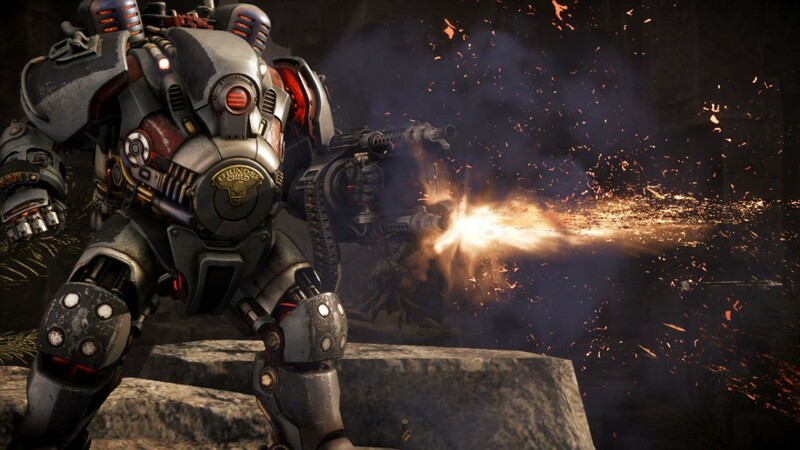 The first hunter to arrive is the assault class character Lennox, the first hunter in Evolve to have a melee attack. Lennox comes equipped with her ‘Thudnerchild’ mech suit, featuring a Plasma Lance that’s deadly in close combat. She also comes with an Autocannon and Thunder Strike attack though – useful when close combat isn’t an option. Lennox will be arriving June 23rd. Evolve was very well received at launch and the new DLC will bring extra life to the game. Turtle Rock co-founder and design director Chris Ashton has even said that “Each of these character introduces combat mechanics that are brand new to the Evolve gameplay experience.” Guess it’s time to get back into the game and learn whole new ways to hunt!